– for some thematic content involving peril, and brief strong language. When you think about man landing on the moon, in this day and age, it’s understandable to take it for granted — especially with imaginative space adventures from galaxies far, far away gracing our screens each year. But the truth is, it was a hard, emotional, and dangerous road to make such an achievement. 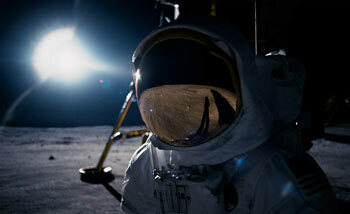 Film First Man is a biopic about Neil Armstrong–the first man to ever step foot on the moon. During the infamous “Space Race” with Russia, it was quite a miraculous feat to actually, not only build a livable craft that can sustain human life in space, but actually land on the moon’s foreign surface. First Man does a good job of shedding some (dramatic) light into Armstrong’s personal life and mankind’s journey to the moon. The story is told through Armstrong’s calm and collected eyes, first introducing us to the man while he’s testing an X-15 plane in the desert, which served as his first encounter with breaking out of Earth’s atmosphere. Ryan Gosling plays Neil as awkward and reserved, often keeping to himself, all the while holding his brilliance just below the surface. The downside to this, however, is it’s tough to get close to Armstrong as a character. He’s only moderately relatable, and it relies more on the audience’s level of interest in watching Gosling the actor and knowing what Armstrong will inevitably do. The biggest thing the film uses to try to ground Neil and give his story an emotional weight is focusing on the fact that he actually had a beloved two-year-old daughter that he lost, tragically, to a terminal illness. The story paints the traumatic experience as dehumanizing Neil a bit–making him more closed off and withdrawn. It’s something that isn’t helped by the fact that, due to the danger of the space program, he is frequently getting to know and then losing friends due to unexpected accidents. This poor guy has been through so much (a scene depicting his family losing their house in a fire–which actually happened–was cut out, but only further pushed this sense of loss he experienced), that it only makes the sweetness of his victory–landing on the moon–that much more satisfying. Damien Chazelle, who directed the 2016 hit La La Land, exsplores new cinematic territory with this biopic. 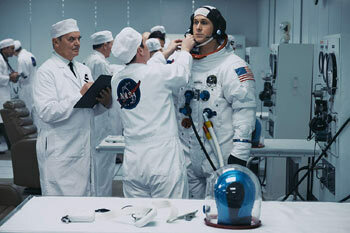 It’s no easy feat to try to recreate–in accurate detail–true events from the space program in the 60’s, and the director’s tenacity in trying to get it to feel as real as possible pays off. There really isn’t a moment in the film that feels like green screen or copious amounts of CG were used to complete the scene. He tries to keep it as visceral as possible, and does a great job. The pacing teeters between sluggish and hurried, though, with some sequences plodding along a little bit, and others feeling a bit rushed through. The movie doesn’t exist to be an action-packed thrill ride, but the director does his best to put viewers in the cockpits alongside the characters–especially to share the claustrophobia of it all–and it makes the whole film feel all the more personal and intimate–on the ground and in space. There’s a lot of tension created in these sequences–from creaking and rickety take-offs to keep you feeling uneasy and nervous, to awkward moments of tense confrontation between Neil and his wife Jan, or an extended shot of Neil crying alone in a room following the loss of his daughter. This isn’t Michael Bay’s Armageddon, or even Damien’s La La Land; this story makes you feel the triumph and tragedy, ironically, as down to Earth as possible. I don’t know much about Armstrong’s personality, but I found Gosling’s portrayal especially dry. 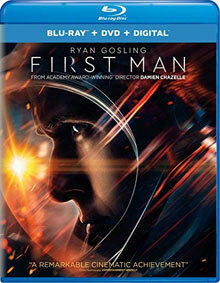 It seemed fitting for what the film was aiming to accomplish, but even a friend who had a deeper knowledge of the famed astronaut thought Gosling sucked the life out of the character. While injecting some more personality could certainly have benefited the relatability of Armstrong to the audience, I still felt like Gosling’s portrayal felt real. On the other hand, Claire Foy’s stiff and confrontational portrayal of Neil’s wife Jan felt even colder and more harsh. Although anyone can really imagine what an astronaut’s wife in the 60s might have been going through, Foy’s take on Jan was abrasive to the point of being hard to watch. It’s hard to say if that’s an accurate representation of Jan Armstrong, a reflection on the writing, or just how Foy decided to play her, but she not only didn’t come across in a positive light, but was more of a negative on the film as a whole (for me at least), if anything. The objectionable content for the film is almost exclusively language, although it is quite infrequent. There are two “F” words–one from an astronaut after he gets motion sick (the then mouths it in the very next scene), and one shouted very angrily (and loudly) by Foy during an argument between Jan and Neil. There are a handful of other profanities, including some blasphemy, too. It all feels unnecessary given the educational nature of the story, and it immediately makes it less family friendly. (My 8-year old saw the Blu-Ray cover and expressed interest in the film, but I told him it’s more for adults.) Apart from the profanity, the drama involving the loss of Neil’s child, coupled with the frequent loss of life through the dangerous situations the pilots find themselves in makes the nature of the film a heavier and more dramatic one (not to mention the aforementioned marital tensions). Overall, it’s a firm PG-13 rated film. Overall, if you like biopics, First Man is a good one. It’s a well- made, acted, and directed film, and the attention to detail is admirable. Some of the historical accuracy was tampered with in favor of adding drama to the story (like something Neil does after stepping on the moon), but it’s forgivable considering what they did get right. I had first seen this film on IMAX when it was in theaters, and reading about some of the creative liberties the filmmakers had taken with the story really irked me after seeing it. However, I later saw Bohemian Rhapsody and learned about the much larger and grander creative liberties taken for that one (all for the sake of drama), and it made the changes to Neil’s story seem a lot less manipulative in comparison. Seeing First Man a second time, I was able to appreciate more what was accomplished here. It may not be the kind of movie you’ll want to watch over and over, but it’s a quality production that reaches its goal of helping us value the cost of achieving the impossible feat of landing mankind on the moon. Deleted Scenes (4:17) – There are a pair of deleted scenes, viewable separately or with a “Play All” feature. First is “House Fire,” which is based on a true event, where the Armstrongs wake to a fire in their house and must get out. Neil then realizes they didn’t all get out and he goes back in to get Ricky. It’s a good scene and I kind of wished they had left it in. Next is “Apollo 8 Launch” which just shows Neil watching it take off. Shooting for the Moon (3:40) is the first featurette, and it focuses on their production’s efforts to try to be authentic in telling Neil’s story. We also learn that Damien Chazelle approached Ryan Gosling about playing Neil Armstrong before they made La La Land together. Preparing to Launch (3:39) is about the decision to tell Neil’s story, since few really know it. They continue to put an emphasis on how they were trying to be faithful and honoring with the material. Mission Gone Wrong (2:42) is about the lunar lander crash and how they made the stunt using Ryan Gosling instead of a stuntman–they actually dragged Ryan across the ground through the grass! Recreating the Moon Landing (6:01) – The team used IMAX cameras for the moon landing, as well as the same film stock that was used back in the day to capture the footage. They also recreated the moon surface as a practical set, at night, inside a quarry. Shooting at NASA (3:11) – The filmmaking team shot as much as they good on location in the real locations from the original events. They even were able to use some real, actual things from the 60s, like the van they get into after they return from the landing and computers they used inside NASA. Astronaut Training (4:02) – Some of the cast went through actual astronaut training, and got to see some of the real-life places and equipment from the time period. iTunes Extra: Reverse Engineering NASA (4:18) – The iTunes digital copy for First Man offers an exclusive bonus feature not on any disc. “Reverse Engineering NASA” further explores the filmmakers’ goal for achieving historical accuracy, where they brought in consultants and tried to recreate as much of what was used in the 60s at NASA as accurately as possible. Violence: The film opens with Neil in an X-15 plane that shows the flight as very intense, with constant shaking that causes Neil to struggle to gain control of it; We see Neil bent over a toilet and hear him throwing up into it. After he walks away, another astronaut runs to the toilet; There’s a long, intense sequence with dizzying visuals when a pod spins out of control while docked to a space station; A fire breaks out in a ship cockpit during a test on the ground. They’re screaming and struggling and then we see outside the closed cockpit door as a burst extinguishes the fire, but kills the 3 astronauts inside (we don’t see their corpses); Neil accidentally breaks a wine glass in his hand, we then see blood on his hand and a gash as he wraps it up; During a test, Neil bails from a pod that then crashes and explodes. He lands hard and gets dragged by his parachute.